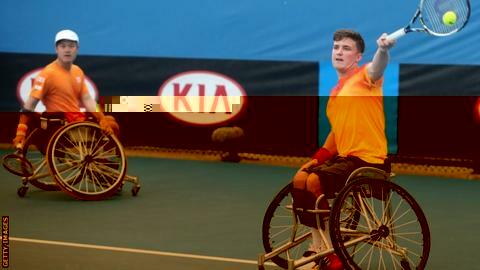 Britain's Gordon Reid is on course for an Australian Open double after winning through to the final of the men's wheelchair doubles at Melbourne Park. The 24-year-old Scot is already into the final of the singles, where he will face Belgian Joachim Gerard. Reid and Japan's Shingo Kunieda beat Gerard and Argentina's Gustavo Fernandez 7-6 (7-3) 6-2 in the semis. They will now meet French top seeds Stephane Houdet and Nicolas Peifer in Saturday's final. Reid, who ended partner Kunieda's nine-year unbeaten run in the singles competition with a 6-3 7-6 (7-1) victory in the quarter-finals, is second on court six against Gerard with his doubles final following at the end of the day.